It’s no secret. It looks like React Presents, a Chicago concert promoter has gotten music festivals down to a science. The company, responsible for music festivals that we all know and love such as Spring Awakening, North Coast, and most recently Freaky Deaky, has just blown themselves out of the water with a 2-day New Years celebration. Reaction NYE took place December 30th & 31st at the Donald E Stevens Convention Center in Rosemont. React took the old-school illegal warehouse raves and made it 10x more massive, 10x more legal, and 10x more fun with 3 stages, an arcade, and a skate park. It’s obvious React has become more than just a company that throws concerts. They have started digging into new territory to provide a new and fun experience for the attendees. And this time, they nailed it. 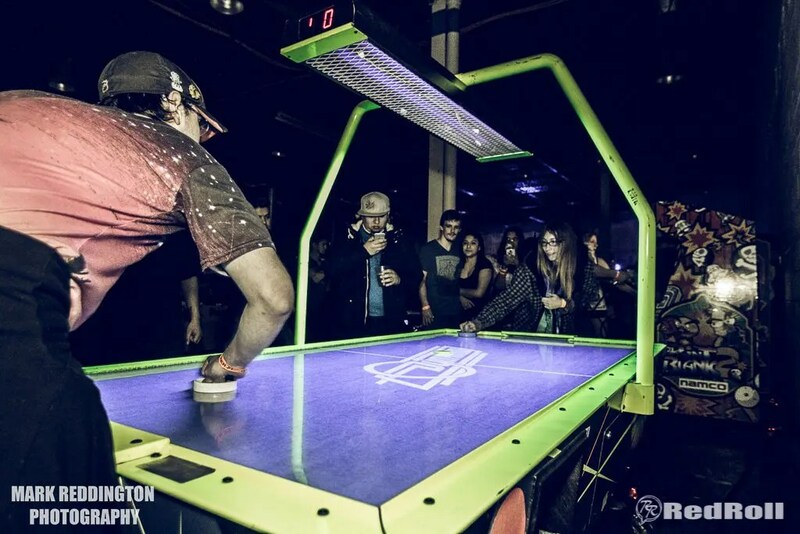 Air Hockey Table. “Arcade Stage” at Reaction NYE. The breathtakingly grand main stage featured 2 massive LED panels for those in the back to see the performers. Enthusiastic attendees clowned around on the arcade machines. And in such a huge convention center, it being packed was definitely not an issue. Overall the festival was one that we will come to for years to come. Dec 30th & 31st pictures have been uploaded! View them below.